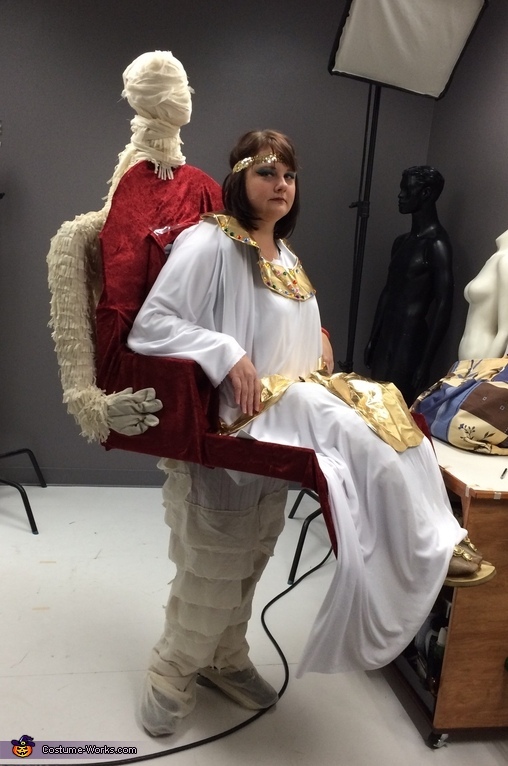 Cleopatra is me, the mummy is carrying me in the chair. My legs are the mummy's and the top of the mummy is fake and so are Cleopatra's legs and feet. I'm obsessed with Halloween and the illusion costumes. I wanted something different and always wanted to be cleopatra. First I started with large cardboard boxes and cut them to form the chair and a hole in the bottom for my body to fit into. Attracted to the chair and my back is a backpack the straps are hidden under the white fabric of my dress. The fake legs for Cleopatra I found a tutorial online to use Saran Wrap and packing tape on your own legs to create them. I wrapped my legs in Saran Wrap the went over it with packing tape then carefully cut it off and taped it back together and stuffed it with plastic grocery bags. Then put on dark nylons on the legs and attached them to the chair using hot glue gun. The mummy legs ( my legs) I took a pair of pajama pants and sewed strips of fabric on them. This took awhile but it worked. The top half of the mummy is 2 PVC pipes I made a cross and duct taped a pillow and stuffing on to make the body. The head is just a foam head. Then I hit glued fabric on the body and wrapped the head in strips of fabric. Then connected the mummy to the chair with a belt (placed under the fabric) and more duct tape and hot glue for more support. His hands were work gloves that I zip tied to my chair to make it look like he was carrying me. Cleopatra's outfit is just a big piece of white fabric I cut a hole in and draped it over me and the fake legs. I cut some gold fabric for the color and belt and hot glued fake jewels on them. I spray painted some flip flops and glued them to the fake feet. The headband is just a stretch sequin strip I got from joann's. To finish it off I put some eyeliner that went way past my eyes and some blue eyeshadow. Everyone at work loved this costume!